Prewar Shanghai: casinos, brothels, Green Gang racketeers, narcotics syndicates, gun-runners, underground Communist assassins, Comitern secret agents. Frederic Wakeman's masterful study of the most colorful and corrupt city in the world at the time provides a panoramic view of the confrontation and collaboration between the Nationalist secret police and the Shanghai underworld. 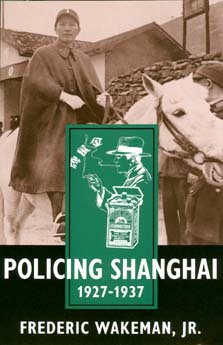 In detailing the life and politics of China's largest urban center during the Guomindang era, Wakeman covers an array of topics: the puritanical social controls implemented by the police; the regional differences that surfaced among Shanghai's Chinese, the influence of imperialism and Western-trained officials. Parts of this book read like a spy novel, with secret police, torture, assassination; and power struggles among the French, International Settlement, and Japanese consular police within Shanghai. Chiang Kai-shek wanted to prove that the Chinese could rule Shanghai and the country by themselves, rather than be exploited and dominated by foreign powers. His efforts to reclaim the crime-ridden city failed, partly because of the outbreak of war with Japan in 1937, but also because the Nationalist police force was itself corrupted by the city. Wakeman's exhaustively researched study is a major contribution to the study of the Nationalist regime and to modern Chinese urban history. It also shows that twentieth-century China has not been characterized by discontinuity, because autocratic government—whether Nationalist or Communist—has prevailed. Frederic Wakeman, Jr. is Haas Professor of Asian Studies and Director of the Institute of East Asian Studies at the University of California, Berkeley. He is the author of The Great Enterprise: The Manchu Reconstruction of Imperial Order in Seventeenth-Century China (California, 1985).